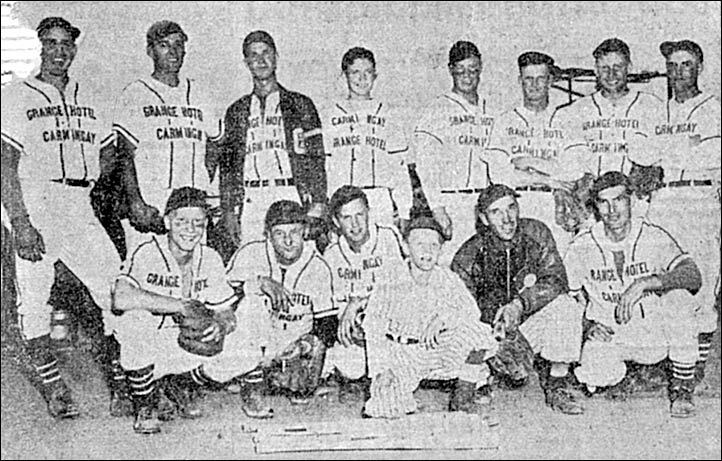 Carmangay, winners of the 1950 Brooks Tournament (defeating Champion 11-0 in the final). Hans Sagstuen, picked up from Brooks after the first round of the tourney, fired a no-hitter for Carmangay in the championship game. Back row (left to right) - Cecil Daniels, Don Jantze, Bob Shearer, Kenny Moore LF, Swede Robertson 1B, Walter Rhodes 2B, Roy McLeod, Glen Rhodes CF/MGR. Front row - Jonas Hurnanen, R.L. Long C, Sid Collier 3B, Fraser Bat Boy, Hans Sagstuen P, Gordon Root.